… was now all but empty, for reasons that Pirate Benjamin the Bitter explained in a comment on this page. 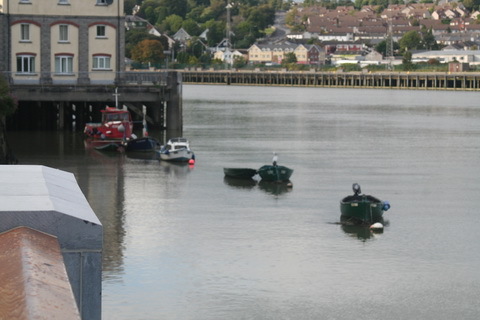 Some boats were moored around the corner on the Suir. … but on the later map (~1910), and on the modern OSI map, that name seems to be confined to the stretch near the bridge, with Scotch Quay used of the downstream section at the confluence with the Suir. Note the crane marked on the map. It’s listed in the National Inventory of Architectural Heritage, although the description seems to have been written by a non-technical person. There are more pics here (and below). 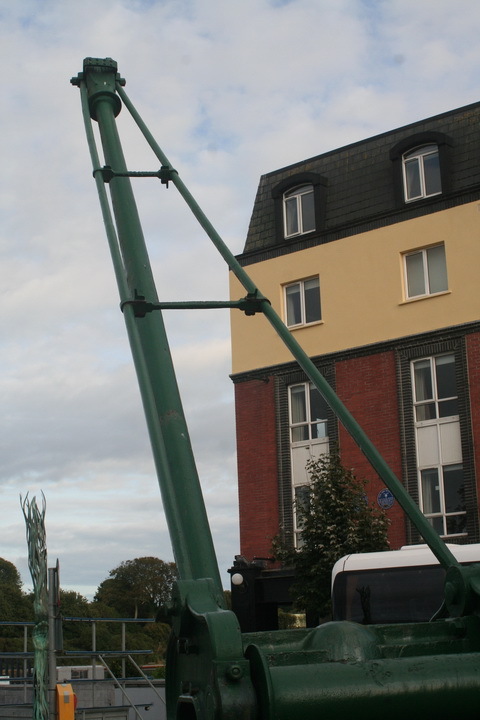 The crane is also on the Record of Protected Structures for Waterford City, but unfortunately that Record is not available on tinterweb. As a result, I don’t know who made the crane or when it was made; I would be glad to hear from anyone who does know [leave a Comment below]. I would also be glad of suggestions from anyone who can provide a better technical description of the crane and its parts. I have never seen a crane like this before and for it to have no markings or stamp marks to indicate who built it, i can see it is going to be a difficult one to solve. I have checked my crane makers lists, that is for the firms i hold, but nothing stands out, plenty of hand cranes by Cowan Sheldon of Carlisle for Waterford Harbour Commissioners, but all there cranes did carry stamp marks of the builder as cast into the iron work and besides it does not match any of the other cranes they are known to have built. What i can say at this stage is this, the crane is a rare example for a hand crane, it really was built by a very professional firm, not some local iron monger. 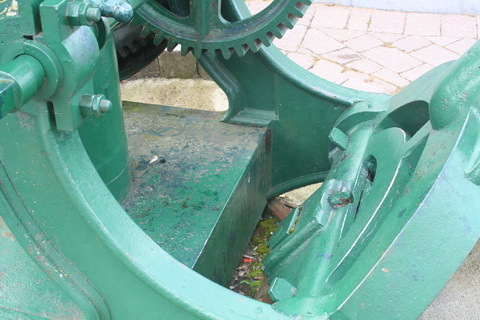 The gearing and swivel for the motion is something not seen on hand cranes and this make it most unusual, so glad it is listed. I will pass this note and photos to several other crane enthusiasts i know and see if we can between all of us come up with the builder and other specification details. 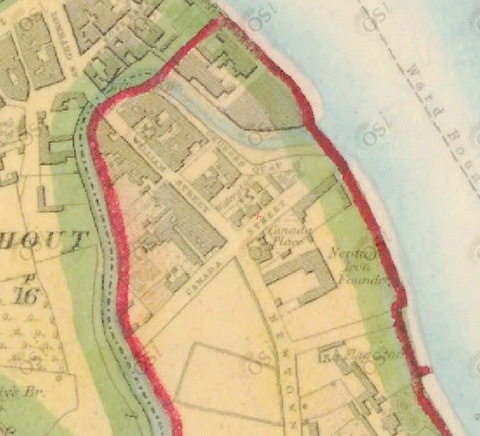 Looking at the old maps, Scotch Quay was where the coal was landed for the gas works so i wonder if it might have been in connection with that, if so the Waterford Archives might have the gas board records and if the crane was for there use, then that might tell us more. By the way after the coal was landed it went along a little 400ft line of tramway to reach the gas works. Well i really enjoyed seeing the crane, so thanks a million. If i find any more detail, i will post it on the site. I have no useful information, but used to climb on it regularly while at Newtown. I like the flood defences, very snazzy. I have looked at the Irish Archeological listings on this crane and one of the photos shows the crane was stamped or printed on but painted over with the words LOAD 7 TONS. It also says it was built c1890s. I can see now why it required all the interesting gearing and rotational gear drive. This is a heavy lift crane, like no other be it Ireland or the UK, hence a very special item and of immense historical importance. Close to where the crane is sited was the Neptune Iron Works and i do have that firm as listed as having built or capable of building cranes. At a long shot, it could be the crane had been built by them for unloading heavy materials or loading of engineering items, such as boilers and engines etc. To lift 7 tons the jib would need to be in roughly the position we see it in the photos, 7 tons lift, would be the maximum capacity, with the jib in almost the vertical position, as the jib falls away the lift capacity is less, but either way given its iron jib, this crane would lift about 5 tons at its full extremity of reach. Research suggests with an iron round jib, probably of cast steel rather than iron, that the date of build is probably in the region of being correct. Cranes first used timber, green-heart mainly for the jib, right up to around 1880s. Cast or rolled steel as opposed to mailable iron came around in the early 1890s. 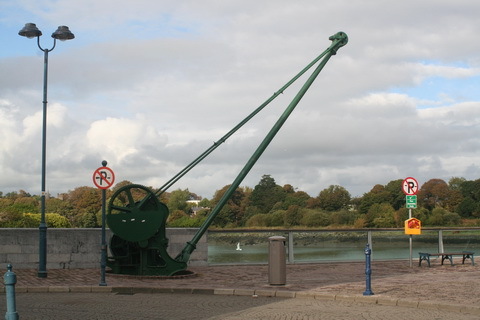 Indeed a superb crane, well done the City of Waterford for preserving it. Carolan, Sir. You say you used to climb on it, i presume when you were just a wee lad. You say Newtown. Is that where the crane was located. Either way the crane i think was not at this location on the Scotch Quay in Waterford, when built, it looks like it has been placed there. Further research suggests it is a precision Engineers crane, it was not for dock side use, although it is on the dock side now. Little more to add on the thread for now. She was never a wee lad …. Have you a link I could put in to any site that would explain about Engineers cranes? 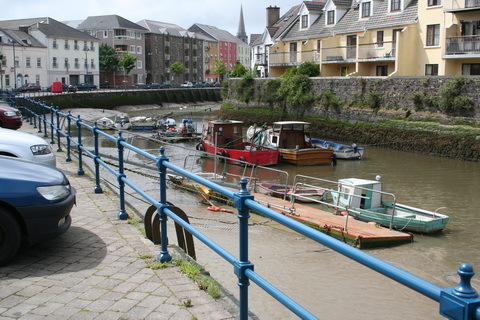 I’ve emailed Waterford Council about the Record of Protected Structures but I haven’t had a reply yet. The crane has been on the Scotch Quay for as long as I can remember although it might not have been in this exact spot. This is a link to a photo my dad took in the early 1980’s of the old steam dredger Portlairge which was moored there for a few years after it was removed from service. You can make out the jib of the crane in the background. I have to admit i am not over familiar with the immediate area, but i think the crane might be further back from the quay than it is now. 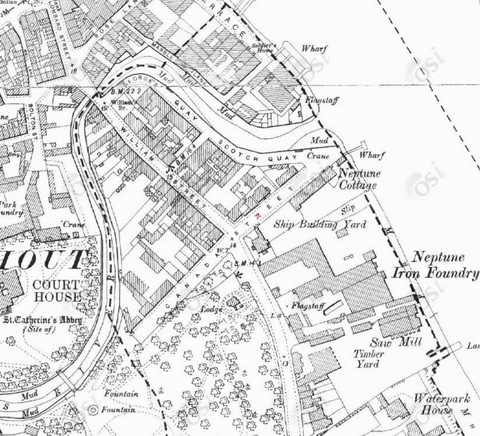 I might point out that on my 1885 and 1910 OS maps for Waterford that a crane is shown on the Scotch Quay. With it being there per OS map of 1885, then it is unlikely to be the very same crane. The steam grab dredger photo is very interesting in more ways than one, i saw this as far back as 1979 under steam on a rather fogy Tuesday morning in August. I remember the day like it was yesterday for as the Rosslare train came into Plunket i looked out and saw the boat puffing down the river, i was off the train at Plunket and ran like a mad man to the bridge to try and get a photo, but the mist just rolled in and everything just vanished, although i could hear its hooter still going strong. Years later i mentioned this in passing and was told it was the last commercial steamship of any description still in use in the British Isles. I see now from the photo that it had its little fixed crane on the deck that acted as the grab, a remarkable vessel if ever. So i must just say, thanks a million for a superb photo and a memory from all those years ago as rekindled. The area has been considerably gentrified since I was a child. I remember it as a place that was full of old pieces of chain and old steel buoys and I think it was used by the harbour commissioners to store old stuff like that. 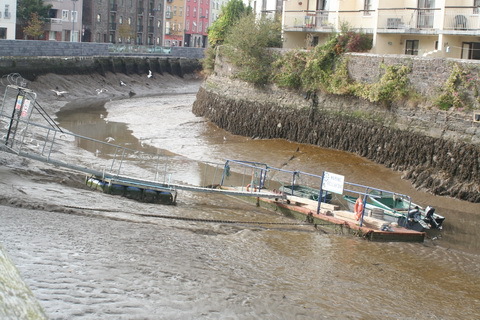 Andrew the dredger is an interesting and sad story in its own right, known locally as the Mudboat, it was built in 1907 by the Dublin Dockyard Company for Waterford’s Harbour commissioners and remained in service until 1980. Waterford Harbour commisioners had planned to sell her to a maritime museum being established at Maryport in Cumbria, unfortunately those plans fell through. The Portlairge was eventually sold to a man from Saltmills in County Wexford for 3,000 pounds in 1987 and sailed under her own steam to her final destination. I think the vessel proved too much for the man who bought her and she now lies rotting near Saltmills in County Wexford. You can see her on Google Earth here. I have seen many hand cranes, and about a third of them have no maker’s name. Numerous foundries – perhaps hundreds – made such cranes over a very long period. Looking for similar ones is a hopeless cause – I don’t think I have ever seen two identical hand-operated wharf cranes! What I can say about this crane is that there is nothing unusual about the design, but the detailing here is in the top drawer for elegance. The quality of the foundry work is generally very high, although I can see a few small casting defects, the finish of the castings being mostly very good indeed. The pattern-making is of an excellent standard (exemplified by the ‘fillets’ in the corners the 4th photo of the crane). The men who made this would have gone home proud, and it is surprising that their firm chose to remain anonymous. One bad feature about the crane is the apparent lack of a brake. This absence is by no means unique, but it is surprising on a crane of this capacity and quality. Those hand cranes could be real killers or maimers. When raising the load, the ratchet provides a safeguard, but the ratchet needs to be thrown clear when lowering. Then, if the men doing the winding are overcome by the load, the cranks will whirl round at a tremendous rate, with huge potential for injury. I can’t say that there definitely isn’t a brake – I just can’t see any sign of one. There might be something in the sheet metal shrouding, but there should still be a visible lever. 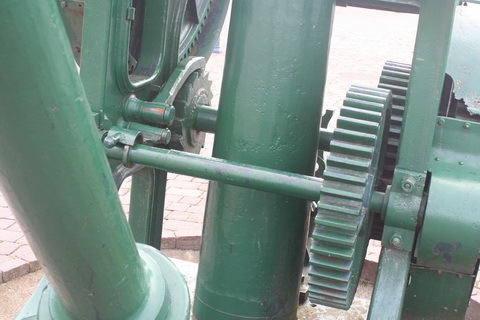 The brake is invariably a band brake, with an iron or steel strip wrapped partly round a plain cast iron wheel. 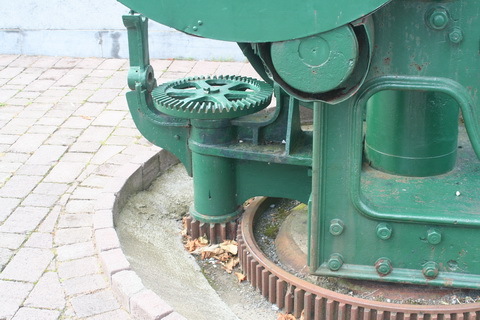 Very rarely, there was no separate wheel, and the band wrapped round the outside of the big gear wheel. What you would expect to see is a boss on the cast iron frame to accommodate a lever for the band brake and lever. If you like, I can send photos of examples. You are right about the method of working. 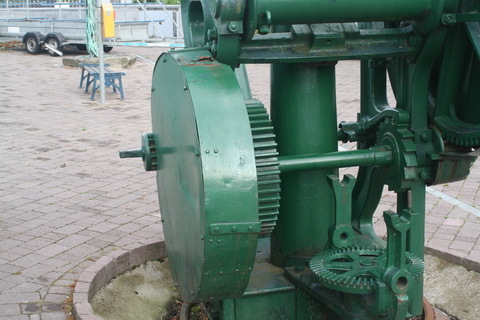 The input shaft can be slid over so to give high or low gearing. 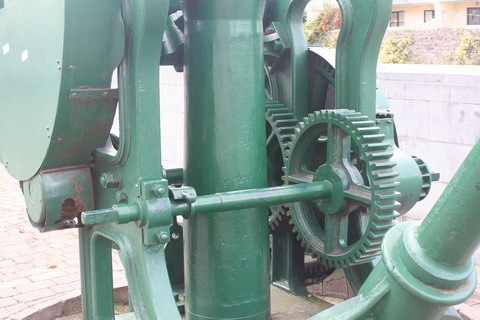 The provision of bevel gears for slewing the crane is not particularly unusual. What is puzzling is that there were two horizontal shafts there. Possibly a two-speed arrangement? Wharf cranes of similar design were in production from the 1830s or earlier to the 1930s or later. The steel or wrought iron tubular jib, and the extensive use of hexagonal nuts (rather than square) point away from an early date. I have no reason to disagree with a date of c.1890. One minor, but very curious detail can be seen in the 3rd photo of the crane. Note the two cross-ties attached to the main tie bars which secure the jib. 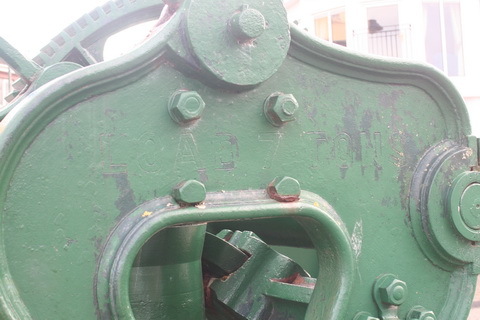 The design of the end fixings on these is unusually posh for this application, although it would be entirely normal on the highly-finished connecting rods of steam engines of the mid 19th century! I see John has a keen eye for detail, even though we are only taking the photos from Brian, John has bought a remarkable amount of new information to this subject. In the photos it struck me that someone had repainted the crane, and that was a real professional job, hence i wonder what Waterford City Council, might know of this crane, it was probably painted at there instigation in the least and therefore i think any new information regarding the builder etc, might lie with them. Seems the hand brake was optional. Assumption must be that if a load can be raised by hand cranking, it can be held and lowered by hand cranking. When at rest the ratchet held it – pawl being pickupable by relieving load with crank. It’s highly unlikely any free fall took place except with very light loads. 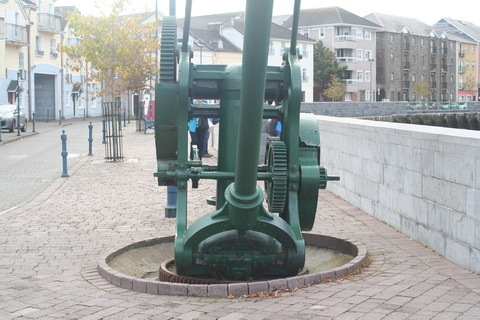 Used by Waterford harbour Commissioners whose main forge and workshops were about 50 yards away on Scott’s/George’s Quay, Also, if I have missed it, the large Neptune ship yard operated by the Malcomson family (see Shipbuilding in Waterford by Bill Irish, UCC) which built some of the largest ships in Ireland in the mid 19th century, may have had a hand in construction? I am involved with Waterford Civic Trust as Bill Irish was for many years. I wondered if it was also possible that the crane was made by Graham’s Foundry in Waterford? They cast lots of nautical stuff around the turn of the 19th/20th century including marine bolllards and berthing posts. their products can be seen all over south of Ireland but usually all carry teh maker’s name. Your site and blog are excellent. Grahams Foundry was on the Quays next door to the present number 108. I dont have much info on it, but will ask on local history group on Facebook. Waterford Archaeological & Historical Society Facebook page has great material on it.plus some pics of manhole covers from late 19th century. 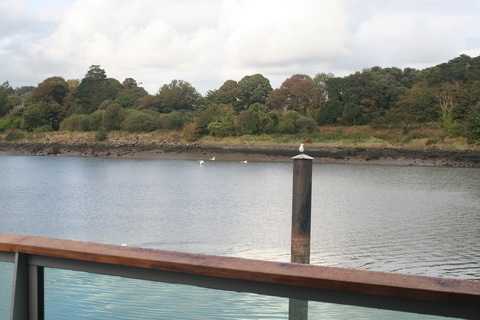 will take some pics of bollards and mooring posts for you. Where can I upload them? All this new information is very encouraging concerning the old crane at the Pill. I was in conversation with a local man on maters concerning things like cranes and in the course of the conversation it emerged that items like cranes that bore no makers plate or castings with makers details were usually sub contract jobs. For instance a firm, might quote for, say a crane, the firm might have then sub contracted the order to another firm and in most cases it was stated that no makers details were to be shown on the said item, this was so the ordering firm would not know who had really built it. I have gone over my crane notes regarding builders or firms known to have built cranes in Ireland. In the North (Ulster) we have William Coates, Lagan Foundry, Rose & Co of Belfast crane makers and builders, while in the South the (republic we have Mallet of Seville Ironworks in Dublin, Grendon & Co of Drogheda and Courtney & Stephens also in Dublin as recognized crane builders and all of these firms built cranes with the name of the builder either shown on a plate or it was cast into the superstructure. The crane at the Pill is thought to be c1890s or early 1900s, so anyone of the above firms could have built it, although i personally do not think it was either Mallets or Courtney and Stephens as the design looks nothing like any of those from these builders which survive. 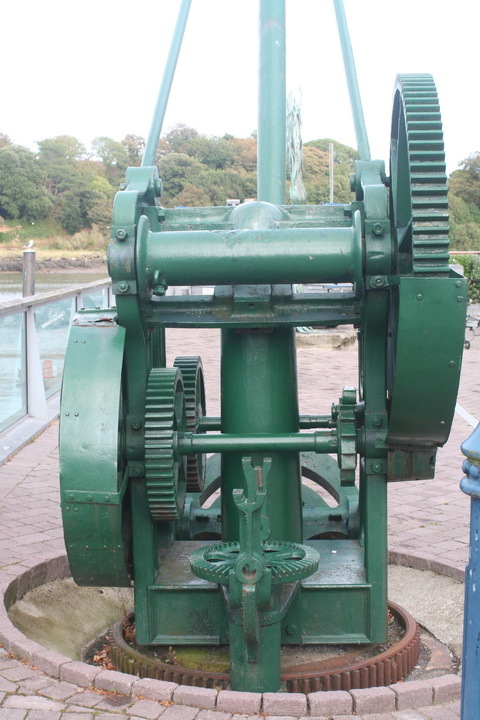 I have also looked over the records i hold for Cowan Sheldon of Carlisle, this firm built quite a lot of cranes for either the Waterford Wharf Co or Waterford Harbour Commissioners over a lengthy period, the earliest being recorded as supplied in 1878 and the last in 1935. Hand, steam and electric cranes all being purchased, yet the crane at the PILL is alas none of those as built as its design does not match those for Cowan/Sheldon. I have a good feeling about the Waterford Historical and Archeological Society, hopefully something through there face book pages will surface to help tie this one up. Regards to all on this thread. Very interesting history there. Thanks all involved. Looking at the pics there, I’m thinking the big cog wheel in the encasement has a drive spigot at the back which would seem to suggest that this was a slower gear for the heavy lift. Yes. Thanks a million Don.